Post Mauryan Period: The Mauryan Empire after Ashoka continued for 50 years. However, one thing which can be stated with much certainty is that Emperor Ashoka’s successors were extremely weak kings. Brhadrata, the last ruler of the Mauryan dynasty, held territories that had shrunk considerably from the time of emperor Ashoka, in spite of the fact that he still upheld the Buddhist faith. In the post-Mauryan era from 200 BC to 300 A.D. the economy, however, moved at a rather accelerated tempo. The post “Mauryan society witnessed some sort of a structural reorientation as significant groups of foreigners penetrated into India and preferred to be identified with the rest of the community. The craftsmen’s profession constituted an important part of that times socio-economic milieu. The craftsmen came to be associated not only with the towns but also with villages like Karimnagar in the Telangana region of Andhra Pradesh. 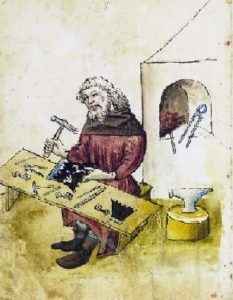 The well-known craftsmen belonging to this era well have laid down evidence that there was noticeable specialization in mining and metallurgy. 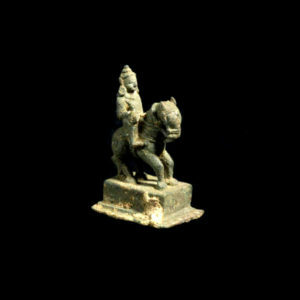 A proof of this is a large number of iron artifacts which have been discovered at various excavated sites relating to the Kushan and Satavahans Periods. A special mention has to be made of the Telangana region which made special progress in iron artifacts including not only weapons but also other goods like balance rods, sickles, plowshares, razors, and ladles which have been found in the Karimnagar and Nalgonda districts. Apart from this, cutlery made out of iron and steel was exported to the Abyssinian ports as well. Equally worth mentioning was the progress made in cloth-making and silk-weaving. Dyeing was a craft of status in some south Indian towns like Uraiyur, which was a small part of Tiruchirapalli and Arikamedu. Oil came to be used rather generously owing to the invention of the oil wheel. The inscriptions belonging to this period mention that weavers, goldsmiths, dyers, workers in metal and ivory, jewelers, sculptors, fishermen, perfumers, and smiths have contributed heavily to the construction of caves, pillars, tablets, cisterns etc. Apart from this, luxury items included ivory and glass articles as well as bead cutting. At the beginning of the Christian era, the knowledge of glass-blowing reached India and became very popular. Coin minting also reached a high level of excellence and coins came to be made out of gold, silver, copper, bronze, lead etc. A coin mold of the Satavahans period shows that almost half a dozen coins could be made out at a time. As far as urban handicrafts were concerned, the most popular were the beautiful pieces of terracotta produced in abundant quantities. They have been found in most of the sites belonging to the Kushan and Satavahans periods. In particular, terracotta figures of great beauty have also been found in the Nalgonda district of Telangana. 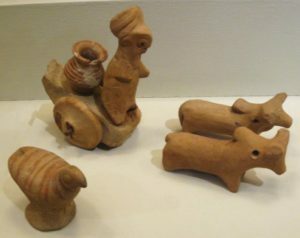 These terracotta figures were mostly meant for the use of upper classes in towns. This immense manufacturing activity paved the way for different guilds. As many as two dozen kinds of guilds emerged during this period. Most of the artisans who have been referred in the inscriptions usually hailed from the Mathura region and the western Deccan which were located on the trade routes leading to the west coast ports. The rather buoyant activity of the guilds attracted the attention of kings. It is believed that the kings had financial interests in guilds and a lot of money came to be invested in commercial activities by the royal kingdom. This naturally resulted in the protection provided by the State to the guilds. The inscriptions which were found point out that the guilds acted as bankers, financiers, and trustees though these activities were actually carried out by a separate class of people known as “Sresthins.” An authority belonging to this period states that the rate of interest generally varied according to the caste of the man to whom money is lent. Apart from the guilds, there were workers bodies also. 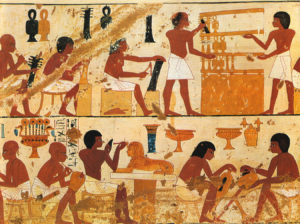 The workers co-operative included artisans and various crafts associated with a particular enterprise. The best example of this activity was the co-operative of builders, which has its members drawn from specialized workers such as architects, engineers, bricklayers etc. The immense commercial activity was strengthened by the flourishing trade between India and the Eastern Roman Empire. With the commencement of movement of Central Asian people like Sakas, Parthians, and Kushans, trade came to be extended across the sea as well. Some of the important ports of this time were Broach and Sopara on the western coast and Arikamedu and Tamralipti on the eastern coast. Out of these ports, Broach was the most important only goods were not only exported but also received from here. The converging point of trade routes at Taxila, which was connected with the Silk Route passing through Central Asia, was an important land route which facilitated trade. The same was the case with Ujjain. The trade between India and Rome mostly consisted of luxury goods. Rome got its imports from the southernmost portions of the country and included Muslims, pearls, jewels and precious stones from Central and South India. Iron articles were important items of which were exported to the Roman Empire while for selected articles India played the role of a clearinghouse, like for instance, silk from China. The Romans exported various types of pottery found in excavations at places like Tamluk in West Bengal, Arikamedu never Pondicherry and a few other places in India. It is also presumed that the Kushans had a brisk trade with the Romans as they conquered Mesopotamia in 115 A.D. The growing number of strangers in the port towns and trade centers led to their absorbing Indian habits as their numbers grew, social laws of the day became rigid as to be seen from the law code of Manu. Further, as conversions to Hinduism was technically not possible, the non-Indian groups slowly grew into separate sub-castes. This process of conversion of a single individual gave rise to a lot of problems. Moreover, the foreigners found it easier to become Buddhists instead of Aryans. It was during this very period that Dharmashastras came to be written. These Shastras made the social structure all the more rigid. Apart from these writings poetry and drama also gained immense popularity. The outstanding poem was Shilappadigaram which was in Tamil while another such famous poem in Tamil was Manimegalai. In Sanskrit, Asvaghosa and Bhasa were the two great dramatists of this period. The manuscripts of Asvaghosa were found in a Buddhist monastery in Turdan in Central Asia. Both of his plays dealt with Buddhist themes. Bhasa appeared a couple of centuries later. His plays are based on the incident from the spics or historical romances around the exploits of king Udayan in Avanti. In the field of plastic art, achievements like the stupas at Sanchi and Bar hut the caves at Karlellora and Ajanta were the major landmarks. At Amravati, which is located in the present day Maharashtra, the great age of painting began. Also, the sculptures at Amravati depict a mastery of stone sculpture and with the establishment of the Mathura school of sculpture, the Indian tradition of sculpture began. The booming trade and commerce of the period were at the base of the urban settlements which came into existence. The important towns of northern India were Vaishali, Pataliputra, Varanasi, Kausambi, Sravasti, Hastinapur, Mathura and Indraprastha. 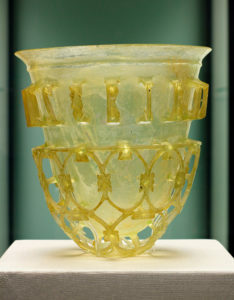 Most of the towns flourished in the Kushan period as revealed by excavations. The excavations at Sonkh in Mathura show as many as seven levels of the Kushan are but only one of the Gupta period. Again in Jalandhar, Ludhiana and Ropar also several sites show good Kushan structures. The Satayahans kingdom also witnessed thriving towns like Tagar, Paithan, Dhanyakataka, Amravati, Nagarjunakonda, Broach, Sopara, Arikamedu, and Kaveripattanam.